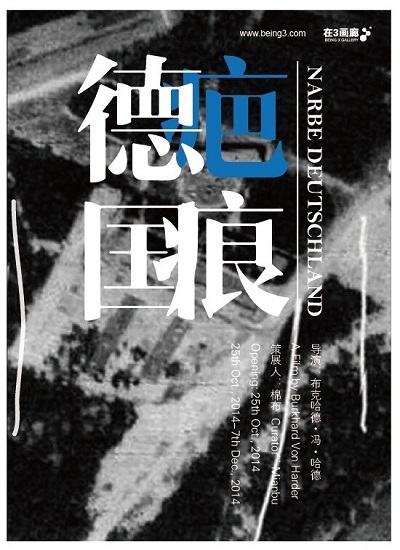 ”Narbe Deutschland | Scar Germany“ (2014), a 16 hour journey throughthe physical landscape and ideological boundary that once divided the world.The film maps the complete length of the former Iron Curtainremainsof the 1378 km long demarcation line separating the former twoGermanys. As part of the Iron Curtain that ran from the BlackSea to Finland with an overall length of approximately 8500 km, the innerGerman border was splitting the country itself. Filmmaker and visual artist Burkhard von Harder enlisted the aid of ahelicopter and pilot to follow the precise course of the former dividing line.In this single shot aerial survey, the camera is following this line as closeas possible, sometimes getting lost producing one single uninterrupted movementthat is just cut due to the need of refuelling the helicopter. Slowly thecamera follows the line below through the four seasons in the course of morethan three years: what appeared to be a line proofs to be a cycle that morphsinto a spiral, indicating change. This real time film document shows the ‘Scar’still in the process of healing. The attempt to find the ‘path’ is akin to theattempt to recall permanently the past as part of the struggle of contemporary German society to comprehend its history. The land itself carries invisibletraces of what has been written on the ground. It is the retracing of the tracethat is the intent of this film. By doing so, Burkhard von Harder seeks tocreate a meditation on the past and perform an act of cinematic healing. This 967 minute-film, is accompanied by amesmerizing soundtrack, matching 16 hours of constant image flow with 16 hoursof drone music, composed and performed by Klaus Wiese. A brief historic voicerecording by Otto von Bismarck is referencing the time span of a 100 years(1889-1989), setting the tone, other than that the installation is envisionedas empty canvas the viewer is invited to fill him/herself. ‘Narbe Deutschland’, is the second part ofthe project ‘Die Narbe| The Scar’, an experimental single shot documentary film in two parts by German visual artist and filmmaker Burkhardvon Harder. ‘Narbe Berlin | Scar Berlin’, the first part of the project, is a 78 minute film dealing with theformer division of the city of Berlin into East Berlin, the capital of the GDR,and West Berlin, a symbol for Western freedom of thought and movement. The Scarfeatures the total length of the approximately 160 km-long former Death-Stripisolating West Berlin within the East German State.